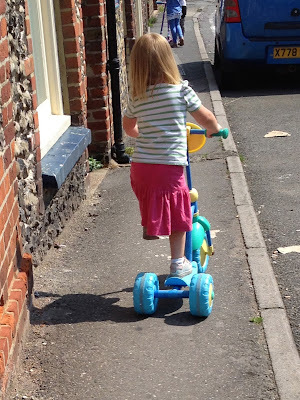 As a treat for the Summer holidays, Daddy Hazelden and I decided to buy the girls new scooters as their previous ones were not only only getting a bit old and tatty, they were also a little bit too small for them now, what with all the growing up they keep doing!!! This was also a great excuse to go for a nice bimble about town in the glorious sunshine that is still gracing us with it's prescence. And just prove how clever she is, she even managed to lift her other foot off of the floor. Not a huge achievement to most people but I was definitely one proud mummy!!! 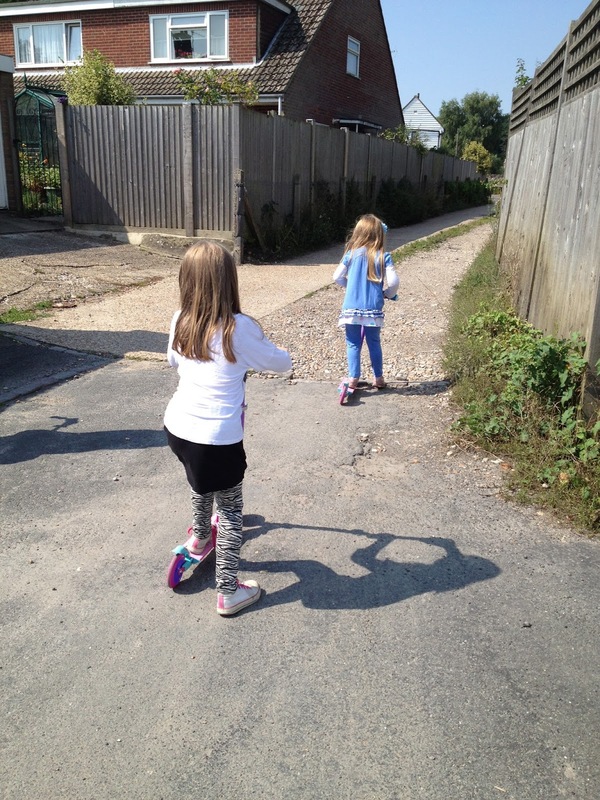 Now Elise and Freya are old pros on their scooters now so they decided the best way to have fun was to race each other. 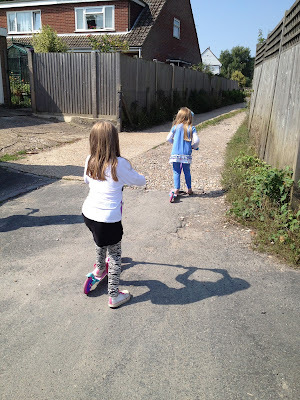 Freya started off in the lead but her older sister sped past her and claimed victory!! So how do your kids travel about town, do they love to scoot or are they more a fan of riding a bike?? How fantastic, my daughter loved her scooter and would be on it where ever possible! Brilliant, I like the look of the one with the double back wheel, sturdy! 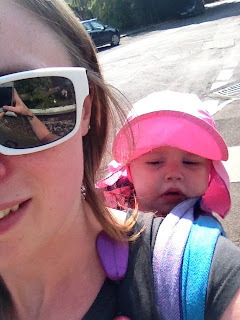 Thanks for your comment on my new shoes post, oh and from one baby wearer to another lovely to see Layla being carried too! 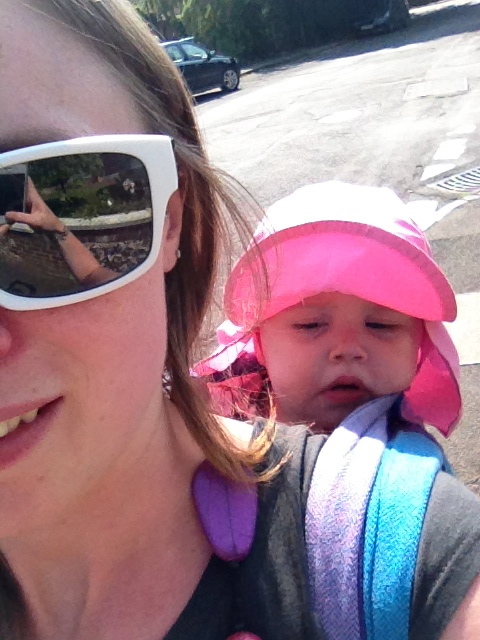 thanks for popping by :) and yay to babywearing!! Oh well done Gracie. We love our scooters here too. she was so pleased with herself now she wants to go everywhere with her scooter!! Aw so gorgeous I love to see little ones on scooters although my little girl is getting a bit too fast on hers. haha yes my 5 year old needs reminding to break constantly!! 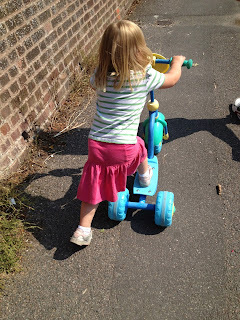 What a fantastic way to travel, I love the look of Gracie's scooter. They all look like pros. 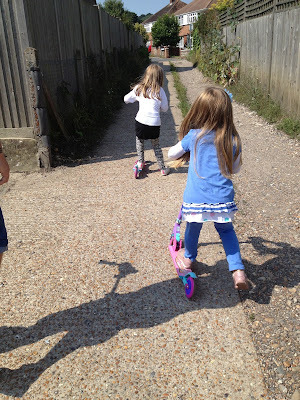 Lovely new scooters - lucky girls, also a fab way to keep active and healthy! Thanks for linking up and sharing with Country Kids.